FITTING THE PIECES reflects the joy and vitality of people coming together to solve problems and, create and celebrate community. This public art work and its setting bring together two worlds – the science of solving forensic problems and the softer social dynamics of rebuilding community. Both are about finding the right pieces and fitting them together. 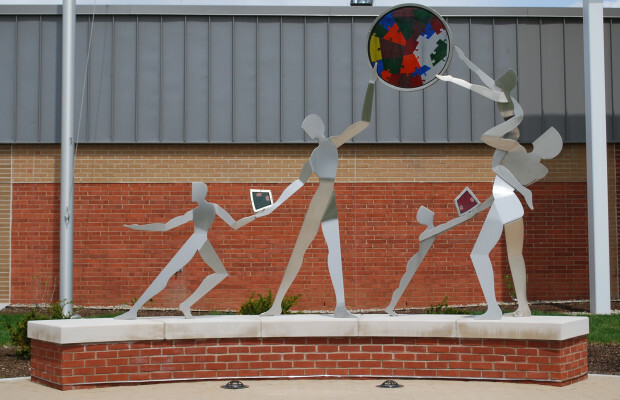 The sculpture’s stainless steel figures symbolize people joined together across generations in work and play. The multicolored glass harkens back to the neighborhood’s former glass industry. 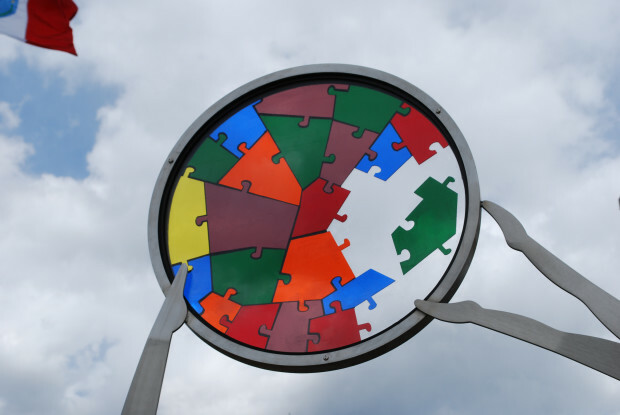 Its multi-colored elements represent parts of a problem, a puzzle fit together to solve a past incident. These colored pieces also symbolize Vassor Village’s social diversity and the array of life’s challenges and opportunities for growth. Siting the sculpture at the edge of the building’s street front sidewalk places it in the common space shard by both those who work in and visit the Forensics Lab and live in and visit the community. This shared space supports feelings of mutual ownership, connection to the site and the pleasure of having public art in the neighborhood. Creating a closer bond the capsule built into the sculpture’s base will contain objects relevant to the City and community. October 2013, Project Architects Joe Weithman and Bradley Mull, of Mull/Weithman Architects invited Sculptor Stephen Canneto to tour the Forensic Lab’s construction site and develop a Public Art proposal. 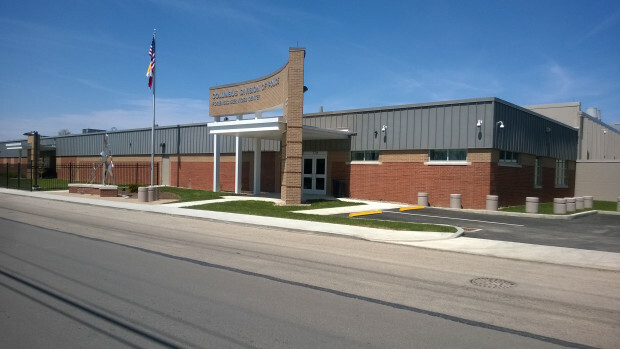 November 2013, information sharing meetings were held with the City of Columbus’ Lab Director, Jami St Clair; Project Manager, John Hanson and Arts Commission Manager, Lori Baudro. 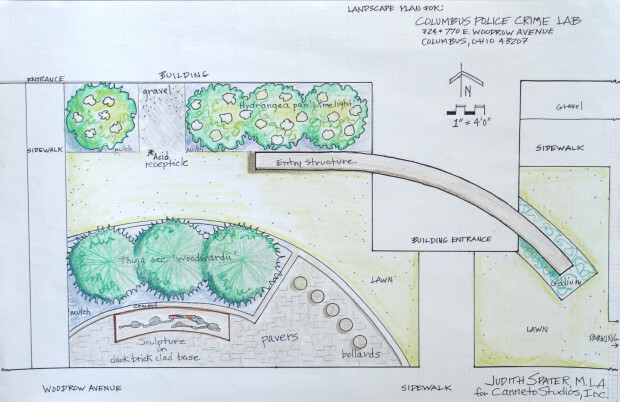 April 2014, Canneto invited Landscape Designer Judith Spater to collaborate on the site’s design. May 2014, prior to design Canneto and Spater conducted information gathering meetings with the Vassor Village Civic Association members. July 2014, the sculpture and site plan concepts are finalized and structural engineering performed by Jezernac / Geers. Concept boards and model are presented to the Civic Association members winning full appreciation and approval. September 2014, as part of the Columbus Public Art acquisition process, Canneto, Spater and architects Mull and Weithman presented the proposed Fitting the Pieces project to Arts Commission’s Board where it was approved for construction. 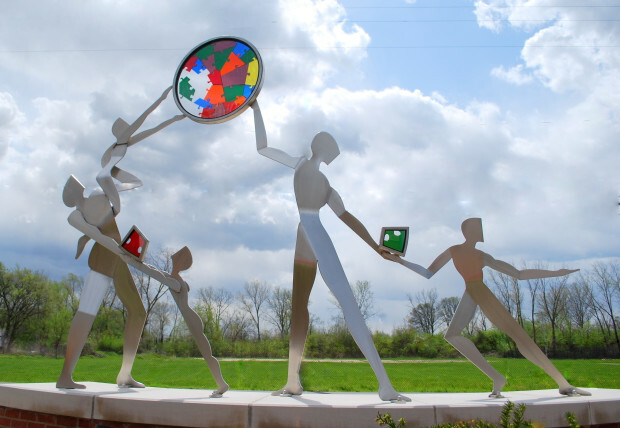 December 2014, Wolf Metal, Columbus, OH contracted to fabricate the sculpture; Thomas & Marker contracted construction of hardscape. March 2015 Fitting the Pieces is installed April 17, 2015 Fitting the Pieces is dedicated in a public ceremony. Aspects critical to the project were: Columbus Mayor Michael Colman’s determination to have the work sited on the street-scape and, the local Vassor Village Civic Association’s involvement. This led to the neighborhood’s first outdoor Public Art Work and the Vassor community’s symbol of pride - reflecting its history of glass production, demographic diversity and vision of neighbors working together to rebuild their community.